England completed a Twenty20 series whitewash over Pakistan after another commanding display at Chelmsford. Openers Lauren Winfield and Tammy Beaumont put on 108 in 75 balls but four wickets in the final four overs pegged England back to 170-5. Pakistan never looked like chasing down that total, however, and England were helped by a strong fielding display. Debutant Alex Hartley picked up two wickets as England secured a 57-run victory. The result means Pakistan have not won a game on this tour in a strong start for Heather Knight as captain, who has seen her young England team play with confidence. Winfield and Beaumont continued their fine form, as their first-wicket stand took their partnership total for the six-match series to 791 runs. The pair played aggressively with Winfield taking the lead, making a half-century from 33 balls and striking a towering straight six before being stumped by Sidra Nawaz. Pakistan came back into the game at the end, with Saida Yousaf taking a stunning overhead catch to dismiss Knight on the boundary as England's middle order stumbled through their final overs. However, it was always going to be tough for a Pakistan side that has struggled with the bat throughout the tour and England's fielding put them under pressure from the start. Natasha Farrant took an easy return catch to dismiss Nahia Khan and, despite the odd loose delivery, England's quick fielding - so improved from the Ashes series last year - kept Pakistan in check. 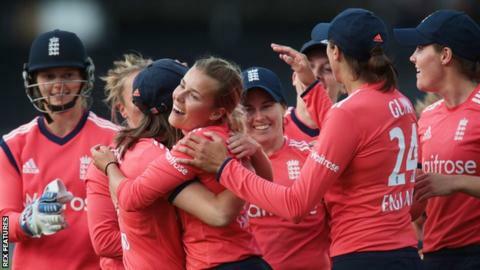 Although the Pakistan middle order showed some fight with some well-timed boundaries, wickets fell quickly and good catching from Fran Wilson and Danni Wyatt, as well as a superb run-out from Wyatt, helped England preserve their 16-year unbeaten record at Chelmsford.